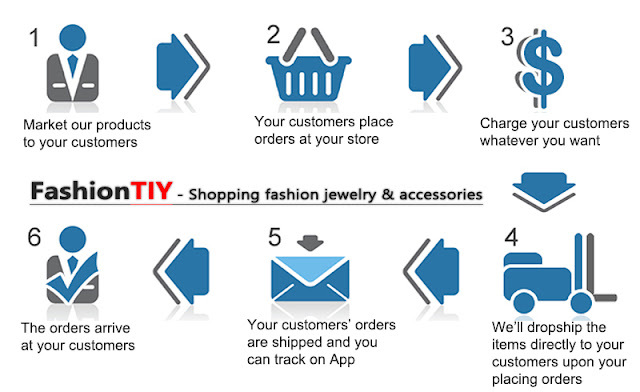 FashionTIY has initiated new zero-stock low-cost e-commerce operation mode in the jewelry & accessories industry. In case of a traditional e-commerce merchant, you should undertake everything including selecting products, taking photos, releasing, receiving customers, accepting orders, packaging and shipping goods. If any problem during the process, you will have to suffer from the loss. Based in State of Delaware, the United States, FashionTIY has initiated the first F2B service platform of the jewelry & accessoriesindustry and provided dropshipping service as for near 10,000 styles of products in 15 categories. Having signed contracts with hundreds of jewelry factories in China, India and other countries, FashionTIY elaborately updates 100+ styles of fashion accessories weekly. All the products are supplied at factory price without MOQ and mix order is always available. Just concentrate on store promotion and customer service in case of cooperating with FashionTIY, and FashionTIY shall complete all the other basic work for you including selecting styles, taking photos, packaging and shipping goods. -Download images and product details easily for free. In terms of dropshipping service, it's understandable that you may worry about the price and quality of products and losing customers therefrom, to which FashionTIY makes promise, since FashionTIY cares most whether you're satisfied with our services or not and looks forward to establishing long-term cooperation relationship with you. Download official APP of FashionTIY now to browse the products and then start the profit model.